Some of the “risks” involved in following our current path are less risks than invisible elephants. Spending always increases above the baseline. Politicians don’t cut programs, they increase them and add more. Whatever spending is in the White House’s budget proposal is the minimum spending we’ll actually see. We already see people like Paul Krugman2 at the New York Times calling for yet another crony aid bill like the trillion-dollar crony stimulus package of 2009. 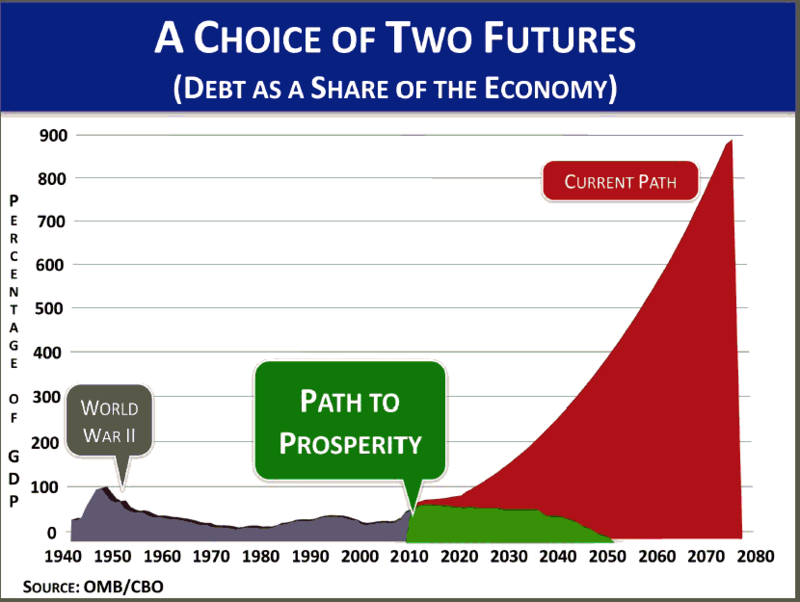 Their argument is that the 2009 spending failed because a trillion dollars wasn’t enough borrowing. Politicians are likely to be very receptive to borrowing more money as a “solution” to the debt problem. But there are more problems to waiting than just the inevitability of politicians spending like politicians. The United States is in a very unique position that has sheltered us from the worst effects of the current recession. Despite the high unemployment and inflation that we’re experiencing, we’re still better off than the rest of the world. But there are several thresholds that, once crossed, drastically reduce the value of our economy and our dollar. Interest on our debt is extremely low. Most of our debt is in short-term loans that have to be rolled over every three years. When interest rates rise, our interest payments will skyrocket. One of the many problems with debt as high as we currently have is that inflation doesn’t help. Normally, if you’re in debt the value of your debt drops as inflation rises. But that only holds when you don’t have to borrow to make your monthly payments and other outlays. With short-term rollovers, the fact that we’re still spending more than we have, and the high amounts of debt we currently have, that’s not true for us. We’re continually borrowing more to meet our current spending. Higher inflation will just increase that because the monthly payments on the debt will increase. The United States dollar is the default for world trade. But we’re coasting on our laurels because everyone else has even worse fiscal policy than we do. The Euro could dominate world trade, if they jumped off of the bailout train and really reigned in spending. I’ll bet Britain could, too, and their citizens are probably more open to such rhetoric than the heads of the various countries of the European Monetary Union. Germany almost certainly could, if they pulled out of the Euro. Once the dollar has a real competitor in the world economy, the dollar will be less desirable. “Less desirable” means it will be worth less. Remember that modern money has no intrinsic worth other than the paper it’s printed on. We can continue pretending it is worth something only to the extent that other people also pretend that it is worth something. The dollar is worth a lot in modern finance because everyone in the world is willing to pretend it is worth something. The fewer people do that, the less it really is worth. There are solutions. First, we should move from budgets that assume spending always increases and that treat smaller increases as if they were cuts (as the current federal budget process literally does3), and move to zero-based budgeting. Every year, the budget should start at zero; programs should be added to it until planned spending reaches the amount of money we have to spend. Then we stop adding programs. If we need some program that isn’t in budget after we exceed the available budget, we need to cut a program that is in the budget to make room. That’s what a budget is supposed to be. That covers important solutions two and three as well: balance all budgets and stop assuming that every program must increase in size year-over-year. Second, we need to convert all defined benefit programs into defined contribution programs where the contributor owns the payment. Social security, for example, is killing our economy because the contributions are disconnected from the payments, and the contributions sit there tempting politicians into using them for this year’s programs instead of saving them for when they’ll be needed. Alternately, if we can’t handle defined contribution with ownership by the contributor, we need to acknowledge that this year’s benefits come out of this year’s taxes. And the total benefits must not exceed the taxes allotted to it this year. We can’t have it both ways: we can’t promise benefits tomorrow and spend the money backing those promises today. There are other very good ideas in the ten acts, such as The Budget and Accounting Transparency Act which brings government-sponsored enterprises specifically on-budget, including the Post Office. I’m not sure how important this is compared to the others, but I wouldn’t be surprised if it gets fought the hardest, just because it will remove some opportunity for billion-dollar shell games such as is performed with the Post Office and the federal retirement fund. There’s also the The Balancing our Obligations for the Long Term Act. This would expand the CBO’s time window to beyond the ten years it is currently limited to. This statutory limit on the CBO’s estimates has resulted in bills where taxes are levied early and spending increased later, so as to push most of the spending out beyond the ten-year window, making it look like budget-busting bills are budget-neutral. It also “requires GAO and OMB to report annually on the federal government’s unfunded obligations” which is also a good idea. While all ten of the acts look like good reforms, any combination of any two of the three acts I’ve bulleted should help us turn around our current out-of-control spending process. The process itself encourages bad behavior: it assumes that spending will always increase, so that just holding the line is headlined as a cut; it assumes that government programs never die; and it assures that a President can get bad budgets passed by threatening to default on our debts. We need this reform package. In response to Paul Krugman’s New Cents: Money is worth only what we pretend it is worth. If we pretend it’s worth nothing, then it is worth nothing. Or at least, one would hope it does. With politicians you never know. Very often, when you hear complaints about how one side or the other is “taking the axe” to some cherished program, what this really means is that someone is trying to reduce the assumed increase in spending on that program. The big brouhaha over Republicans “cutting” SCHIP several years ago wasn’t about Democrats increasing spending on SCHIP and Republicans reducing spending on it. It was merely about the level of increased spending—both Republicans and Democrats wanted to increase spending on SCHIP, but the Democrats wanted to increase it even more. Should I quit my job and rely on public health care? Why do we rely on employers to provide something as important as our health care? If we default on any debt payments, it is because the White House has made the choice to default. There is no need to default even if the debt ceiling isn’t raised for a long time. Raising the debt limit is a concession. It reduces the available revenue and makes it that much more likely that we’ll have to raise taxes. One side of the debt ceiling debate threatened to destroy our economy. One side just wanted to get along. One side wanted to restore fiscal sanity. Which side was extremist? Why “we don’t have a plan” is selfishly incompetent last modified August 31st, 2013.